1. Desitin diaper ointment rubbed into cat fur. 5. A cat hacking up a fur ball complete with writhing round worms on your new rug you've had for two days. Even Lily looked and said, "That's very bad." 7. A quart of silver paint spilled on the carpet. 8. More than five round trips to and fro to the school per evening. 9. Canned cat food opened and then forgotten behind a laundry basket. 10. Multiple kids microwaving marshmallows and chocolate in a sugar frenzy. I am noticing some interesting trends in the above ten items. If I could get rid of the cat and floors, I'd knock out a whopping SIX of the above ten entries!!! This is an epiphany! Flooring and felines ruin my life! More to come later...I have to go now and make my...let me think...yes my FIFTH trip to pick up a kid at the school. Hey, at least the car's still warm from the last time! 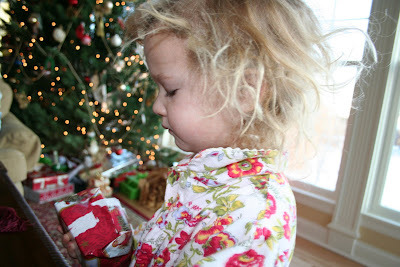 Here's a picture of Lily Christmas morning opening up some of that "Dollar Store Candy!"